The beauty of train travel is that it offers the chance to discover so many diverse places in a relatively short time period. I love how you settle into a room that moves, each day delivering a new destination when you peel back the curtains. On board India’s luxury train, the Maharajas’ Express, each and every day you are introduced to a fascinating new destination – most days offering more than one heritage site or cultural experience to immerse yourself in. 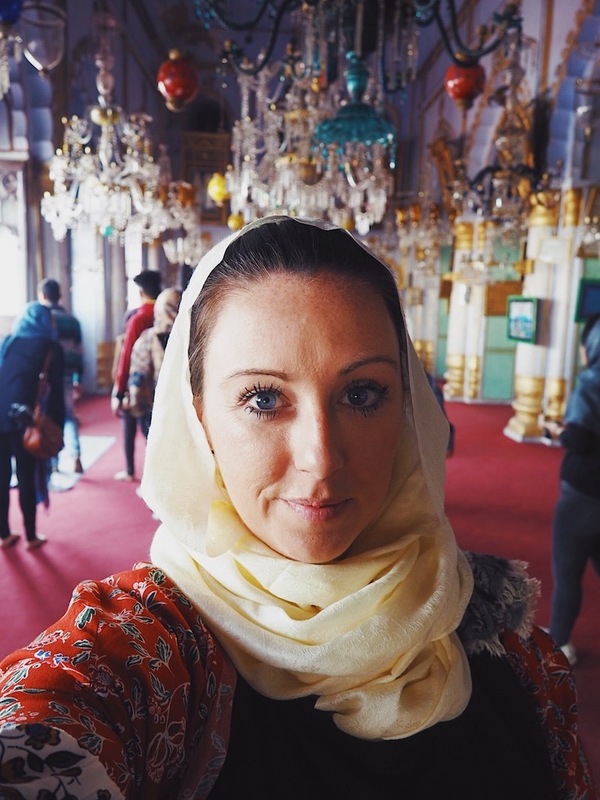 I was a lucky guest of the Indian Panorama itinerary – essentially 8 days of being spoiled by the luxury of the train and delighted by destinations it delivers you to. 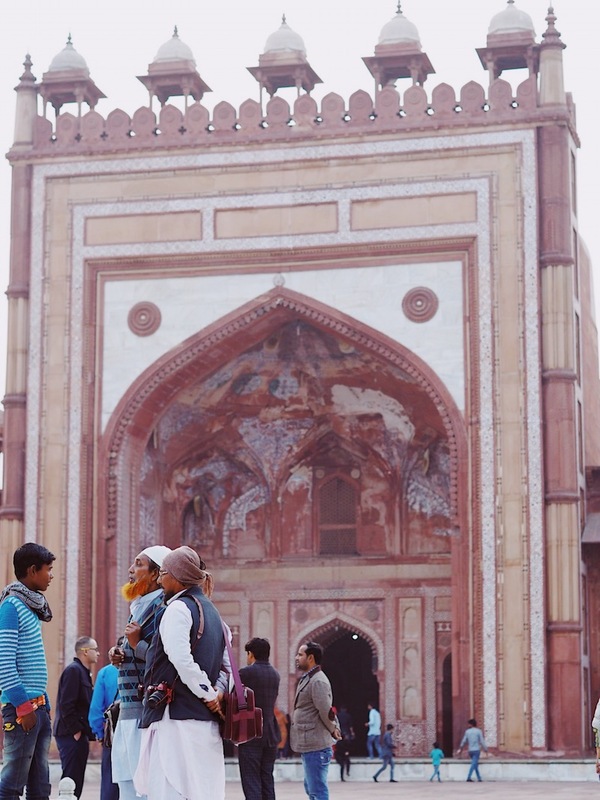 From world-famous monuments, to Mughal forts and Maharajas’ palaces, here are some of the incredible places in northern India you can discover on Maharajas’ Express excursions. 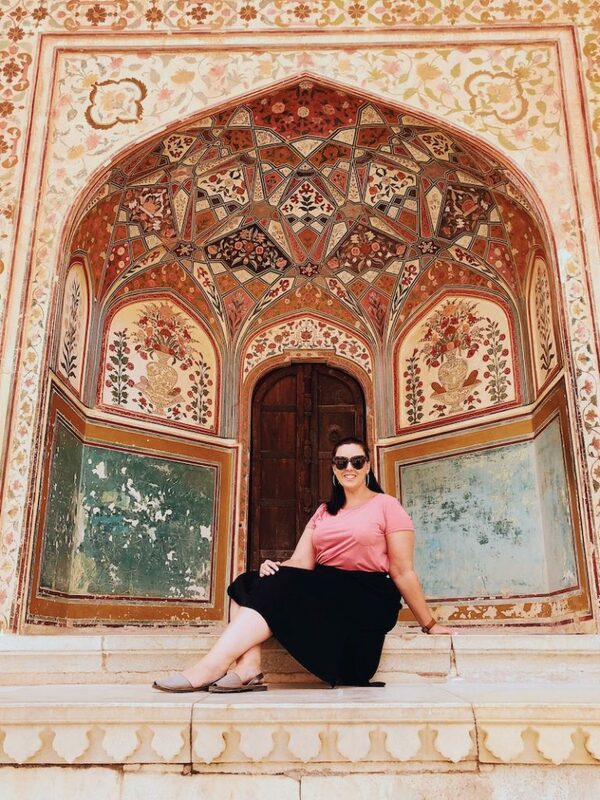 Our journey on the Maharajas’ Express begun and ended in Delhi and I wanted to take a little time to explore the city before beginning the 7-night rail journey. 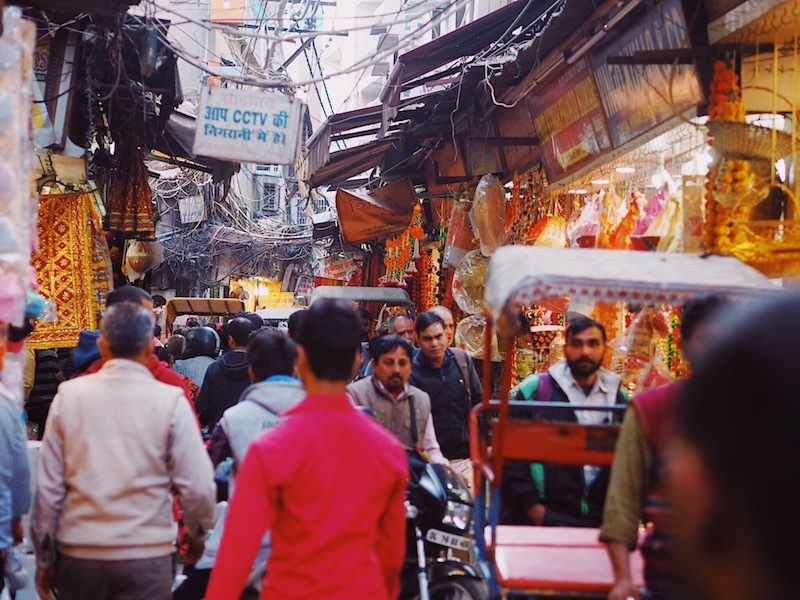 From ancient Humayun’s Tomb to the Jama Masjid giant mosque, there’s lots to explore in Delhi but I was drawn towards the maze-like streets and crowded alleys of Chandni Chowk in Old Delhi. Find more ideas for things to do in Delhi. The first destination the train chugs into is the Pink City of Jaipur. Jaipur was one of the stops I was most looking forward to on this trip and its fairy-floss coloured buildings definitely weren’t a disappointment. Jaipur became the Pink City in 1876 when the buildings were painted a terracotta pink to welcome the Prince of Wales. 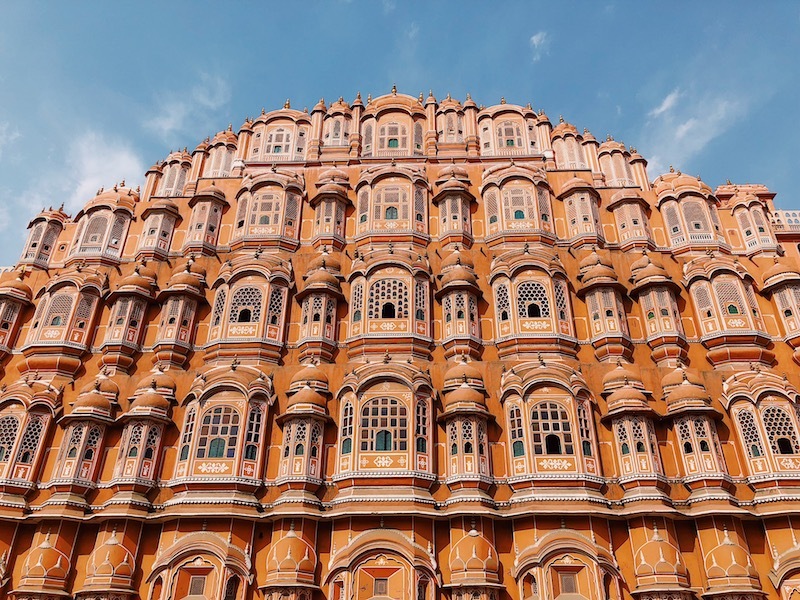 The locals must have loved their new shades though as they kept up the pink paintwork to the present day and nowhere does this look better than on the wedding-cake shaped Hawa Mahal. Our guide then escorted us to the magnificent Amber Fort, one of the most famous forts in Rajasthan, which was built in 1592 by Raja Man Singh. Elephants still plod along the rocky road to the mountain-top fort but we chose to travel by jeep, that is until traffic came to a standstill and we got out to walk among the goats and villagers who live in the shadows of the fortress. 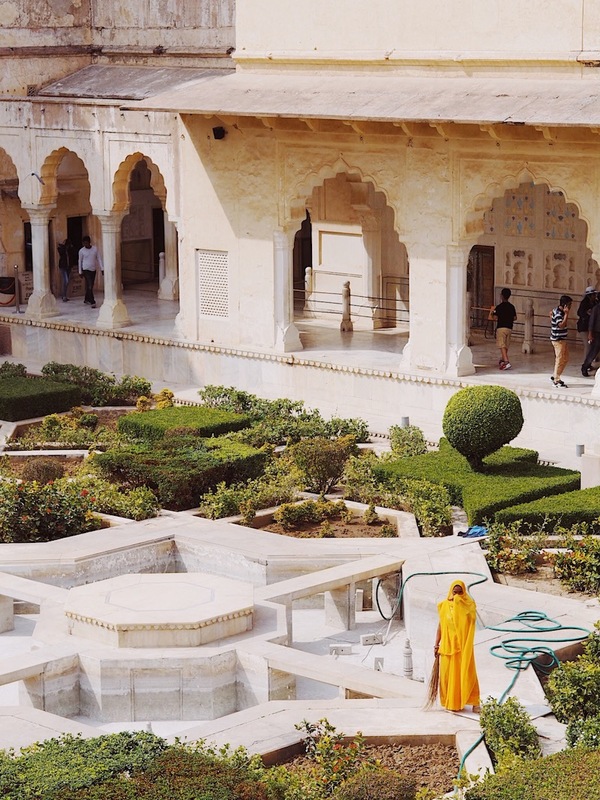 Inside the fort, which is made from sandstone and marble, lie many impressive surprises, including a series of four courtyards, palaces, halls, and gardens. 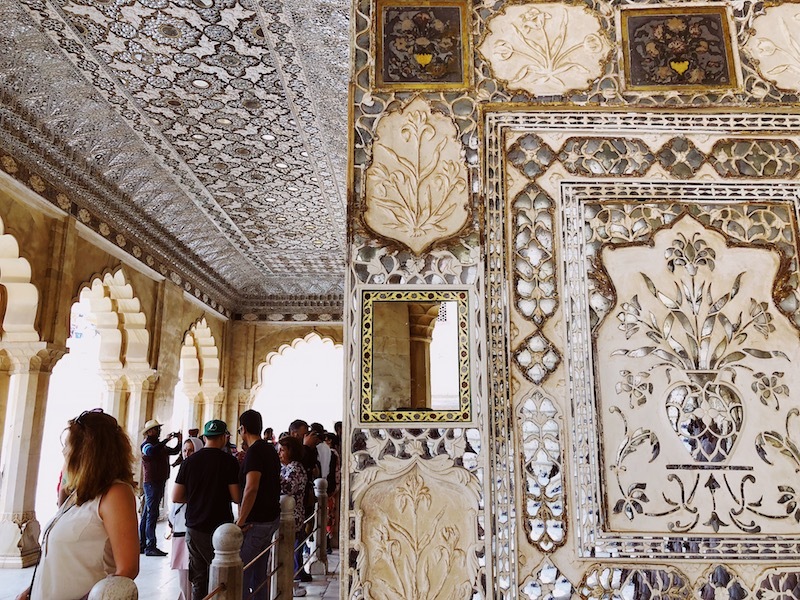 The architecture fuses Hindu and Islamic styles and nowhere is the result more incredible than in the Sheesh Mahal, otherwise known as the Hall of Mirrors, which has dazzling and intricate patterns of glass all over the walls and ceiling. You could spend a whole day studying the artwork and architecture of this mighty building but we had a lunch waiting for us in a palace. Day 3 began early with a game drive at Ranthambore, once a private hunting ground for Maharajas and now a national park famed for its tiger population. We bumped our way around plains that looked straight out of Africa, spotting deer, wild boar and bold monkeys, but unfortunately the tigers were hiding on our visit. 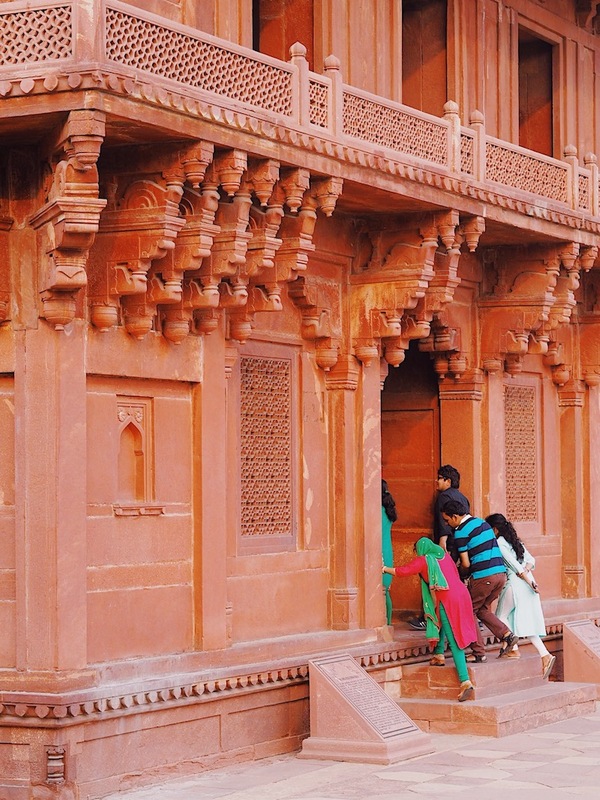 That afternoon we stopped at an intriguing UNESCO World Heritage Site named Fatehpur Sikri – an impressive sandstone city built by Mughal Emperor Akbar in the 16th Century. Fatehpur Sikri served as the capital of Mughal Empire from 1571 to 1585 until it became completely abandoned, it’s thought due to lack of water. Today, the deserted city provides fascinating insight into the life of the Emperor and his 3 wives who were each granted a palace of their choosing – the smallest one lined with gems would have been my pick! With a local guide at our side to explain more about Shah Jahan, the ruler who built this tomb, and Mumtaz Mahal, the woman he made it for, the symmetry, scale and workmanship of the building seems even more impressive. 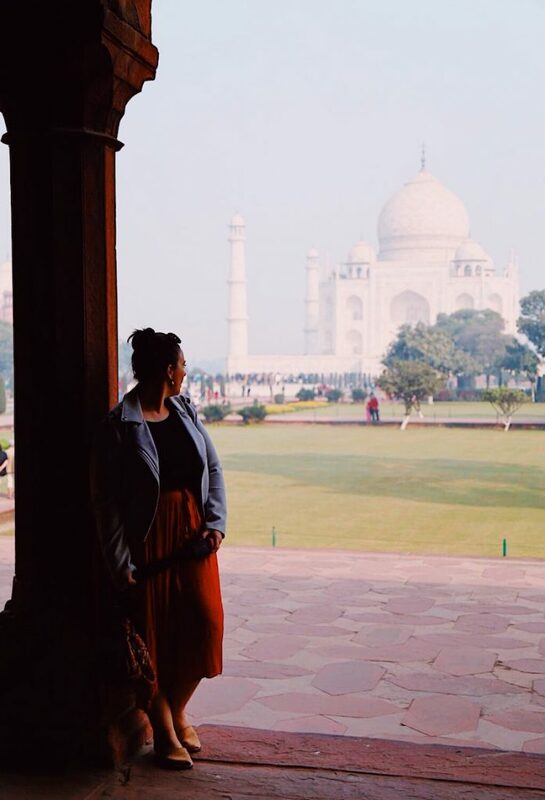 It was wonderful to explore the grounds before the crowds got heavier and then to top it all off we were taken to the nearby Taj Khema for a champagne breakfast overlooking the Taj Mahal. There was sitar player in the corner, a palm reader in another and more pancakes and champagne than this girl could want for – I’ll doubt I’ll ever have another breakfast like it. 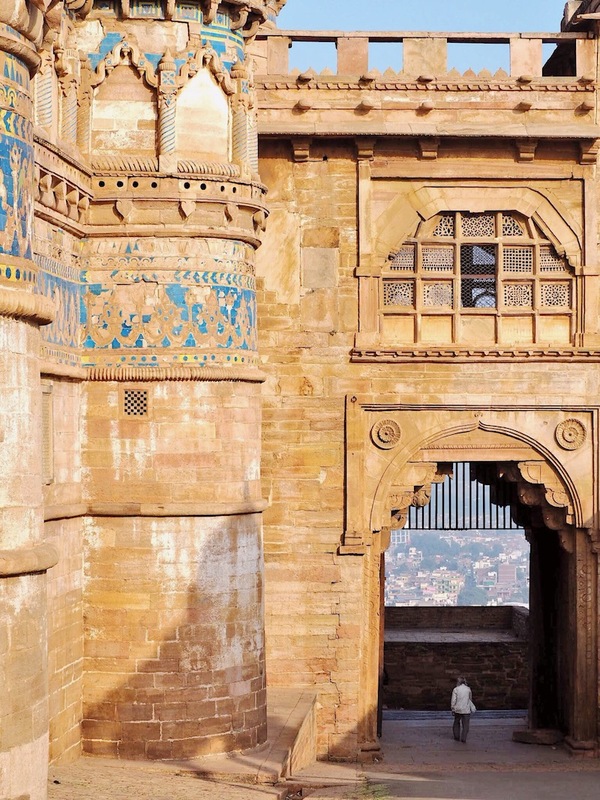 It’s hard to follow a high like a morning at the Taj Mahal but Gwalior’s stone fort and colossal Jain sculptures offer an impressive contrast. 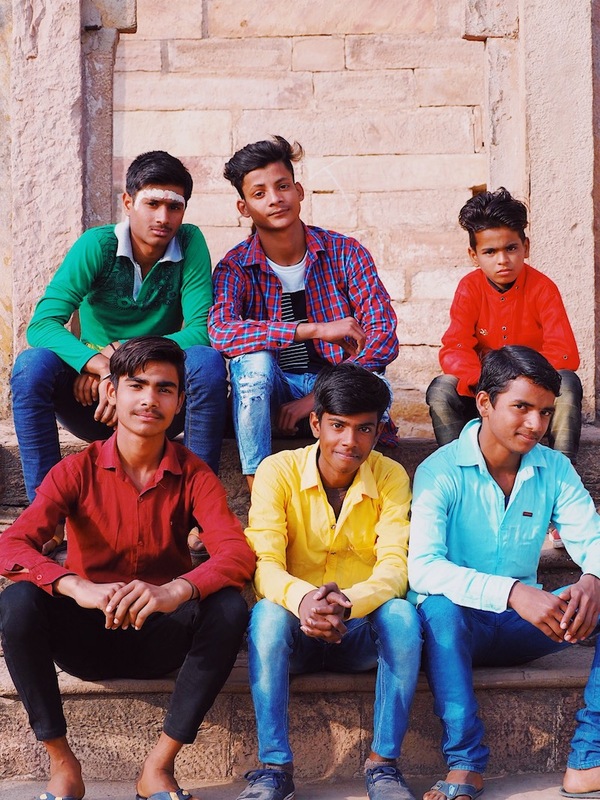 After visiting one of India’s most famous tourist attractions it was interesting to visit little-known Gwalior and find ourselves the only foreign faces. That evening we enjoyed a dinner fit for a Maharaja in the fairy-lit grounds of Jai Vilas Palace, a section of which remains the residence of the Gwalior royal family. Jai Vilas Palace is also a museum which houses a fascinating collection of the royal family’s furniture, clothing, thrones and a model train drinks service made of pure silver! The 3.5 tonne chandeliers at Jai Vilas Palace are sublime! 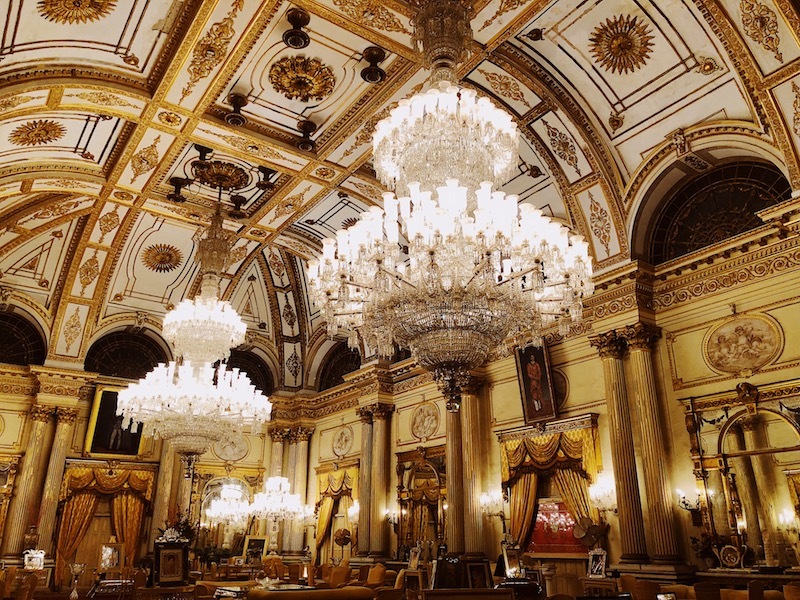 The gold-leaf adorned Durbar Hall blew us all away with its 2 x 3.5-tonne chandeliers, the legend of which goes that 8 elephants were led up to the roof to check they could hold the weight of them before they were hung. Winning the award for the sauciest excursion of the trip is day 5 in Khajuraho. 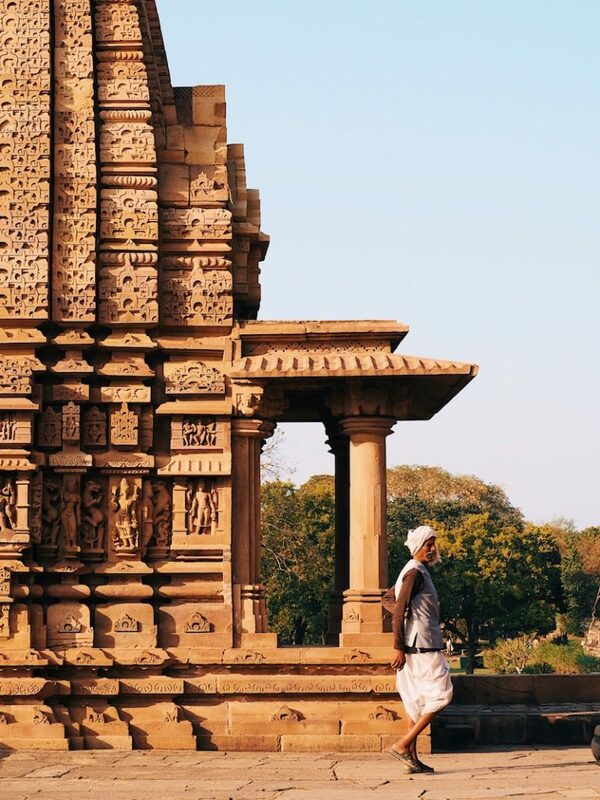 Khajuraho was an important capital of the Chandela warrior kings who ruled Madhya Pradesh from the 9th to the 13th centuries AD but its temples were lost for many years until a British army captain rediscovered them in 1838. 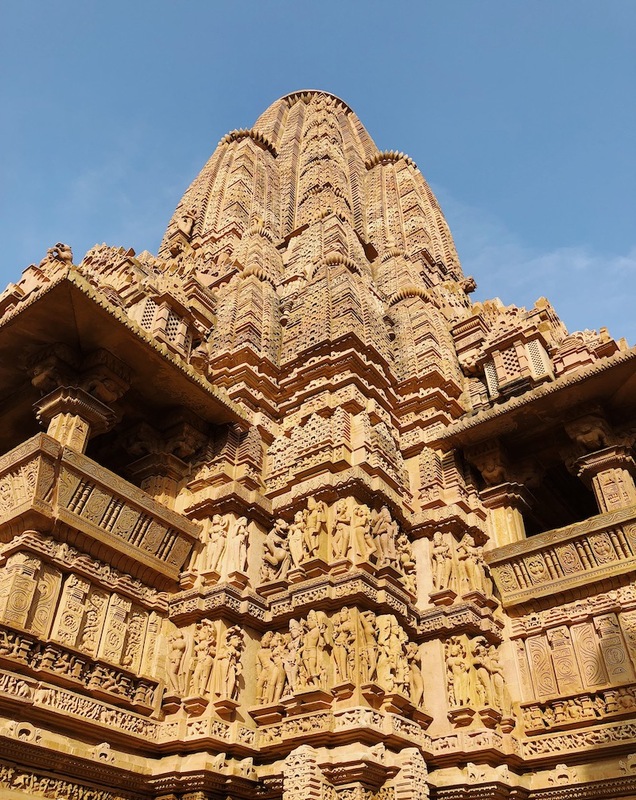 Today, the Khajuraho Temples are one of the most visited sites in India due to the detailed sculptures and engravings in their sandstone that depict deities, war, relationships and couples executing some of the moves of the Karma Sutra. PS I’ve chosen a picture of one of the more tame sculptures but prudish readers may want to scroll quickly. 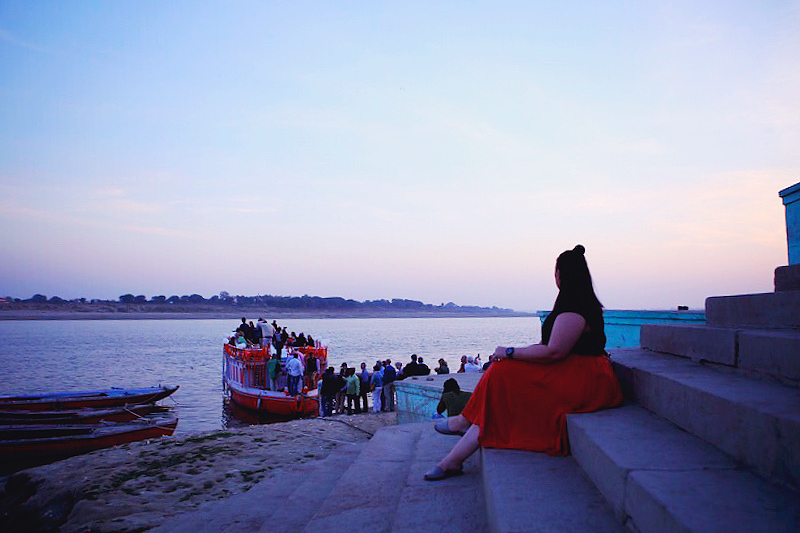 The most moving experience I had on the Maharajas’ Express was visiting the holy city of Varanasi and cruising down the Ganges. Varanasi is one of the oldest living cities in the world and the River Ganges that runs through it is considered the holiest river in India. 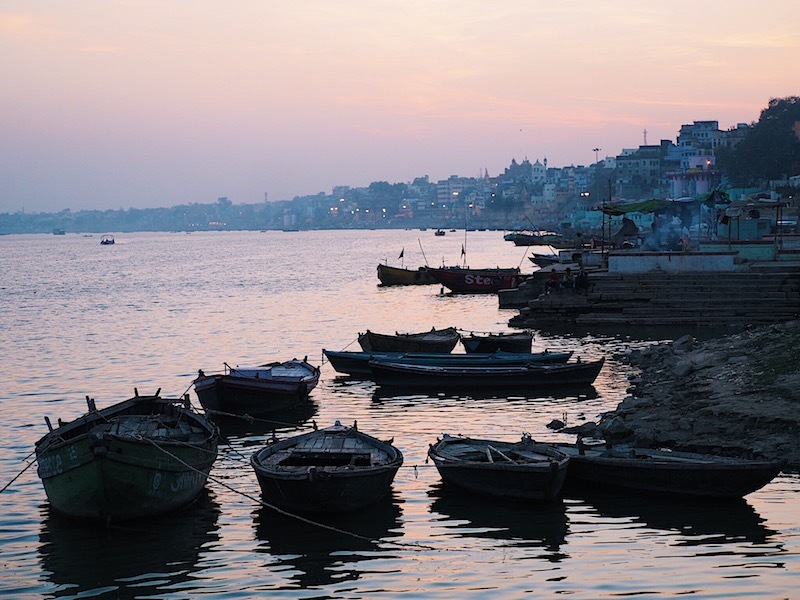 The Ganges is considered sacred in Hindu culture, it has the power to purify sins and end the cycle of death and rebirth, and so many make the journey to bathe in its waters or be cremated on the banks of the river. 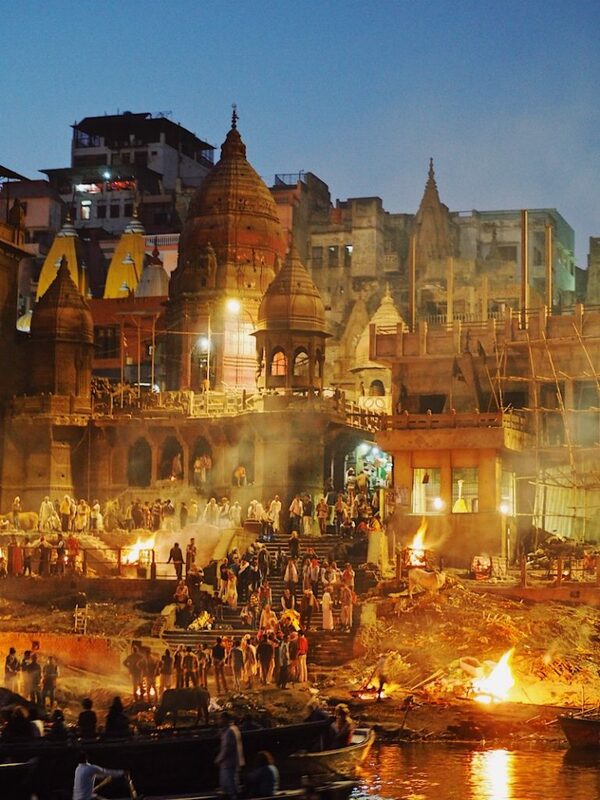 On our boat trip down the River Ganges, witnessing locals going about daily life juxtaposed to the burning pyres of the cremation ghats, the importance of this river becomes abundantly clear. We also had the incredible opportunity to partake in the daily aarti ceremony, a ritual involving flames, chants and offerings, in which the river is thanked and worshipped. It was one of the biggest displays of faith I’ve ever witnessed and the memory of it has long stayed with me. 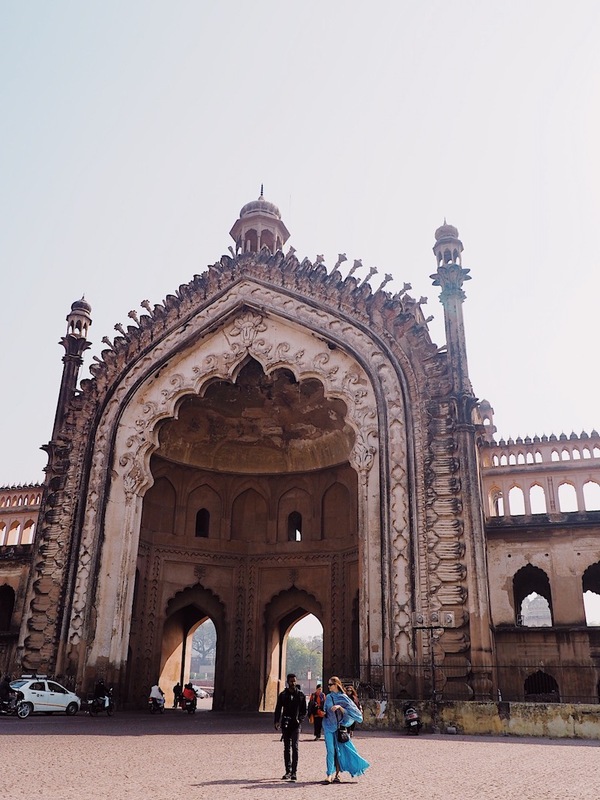 Our last stop on the India Panorama was to Lucknow, a city I must admit I knew very little about. 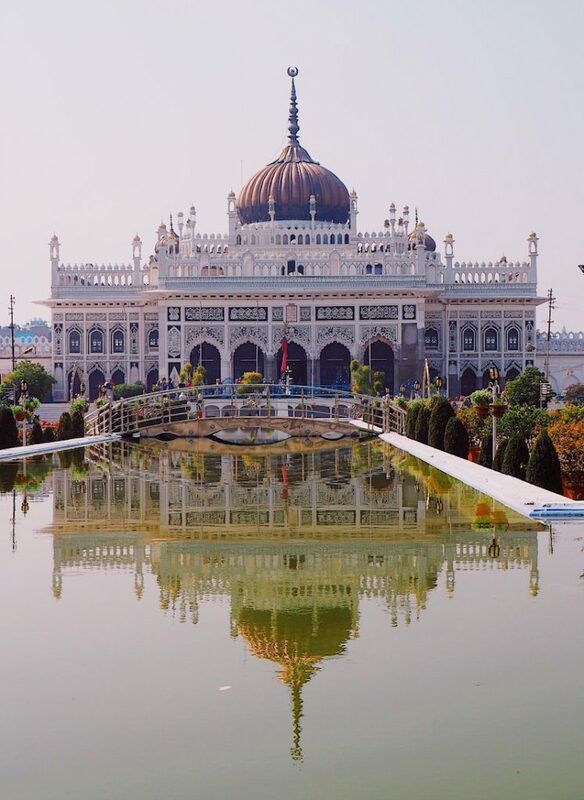 Referred to as the ‘City of Nawabs’ (the title of the Muslim rulers who governed the state of Awadh during the 18th and 19th centuries), Lucknow is home to the dramatic ruins of Bara Imambara, Chota Imambara, Rumi Darwaza and the Imperial Residency, which was the scene of a mutiny and siege in 1857. The unexpected beauty of the Chhota Imambara is what I will remember most about this city. The imambara was built as a congregation hall for Shia Muslims by the Nawab of Awadh in 1838. 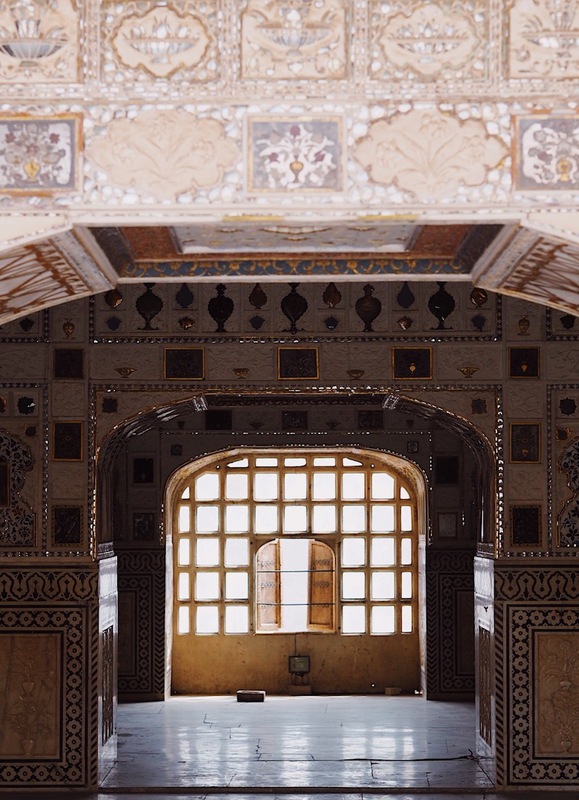 Today, it is the final resting place for the Nawab and his mother and holds a dazzling collection of chandeliers and crystals that have earned it the nickname The Palace of Lights. The most chandeliers I’ve ever seen in one room! On this twinkly note our explorations on the Maharajas’ Express come to an end. 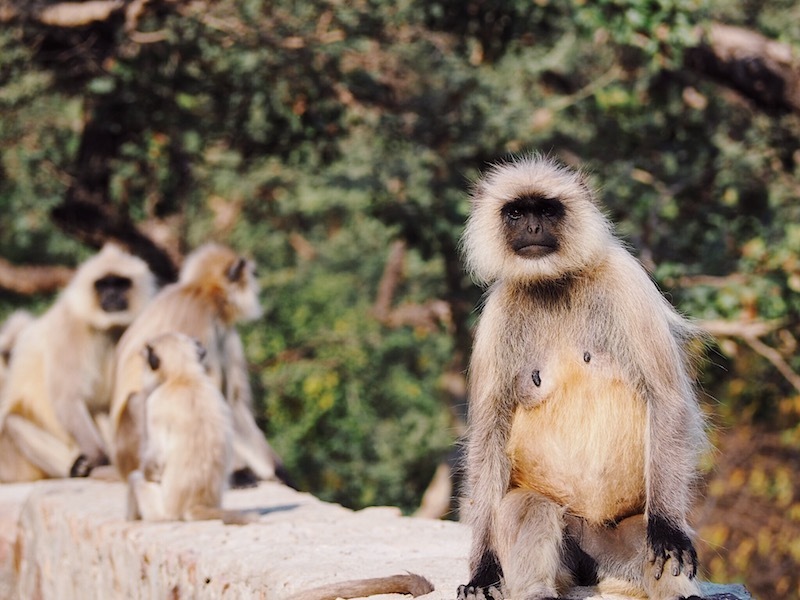 This journey introduced me to some of the most prestigious, memorable and significant sights of northern India – giving me just enough information to know I’d love to go back again! The Maharajas’ Express is one of the most luxury tourist trains in India and has won the title of world’s leading luxury train 5 times in the row. 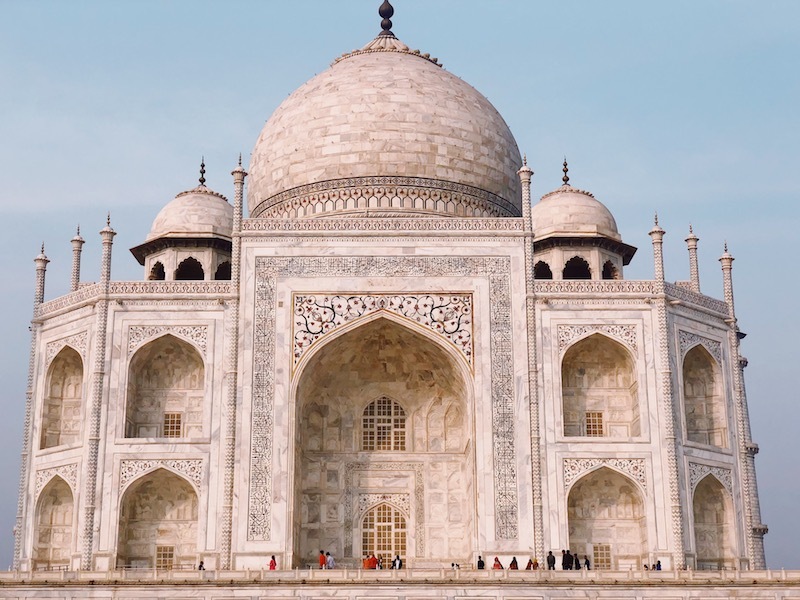 Fares for the 8-day Indian Panorama on the Maharajas’ Express start from $5980 USD and include all meals, drinks, accommodation and excursions. Visit the official Maharajas’ Express website for special companion offers and further details on the train experience and journey. Next Post 7 Ways I Doubled My Blog Traffic In 2 Months - Really! well, your experience in India is great and the way you represent your blogs is really informative. Hope you will be blogging about your experiences in Nepal someday. This looks like such an amazing trip! It’s making me want to head to India even more these days! There is so much beauty in this region alone and I feel like I barely scratched the surface!